A little while ago I came across the fabulous One Handed Cooks blog, full of recipes perfect for little fingers and busy mums. 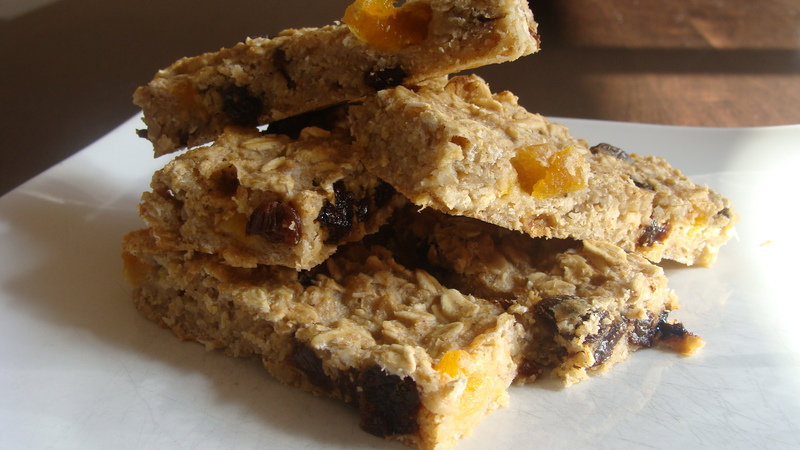 One of the first recipes I tried for my little spoon feeding boycotter was the Chew-me Oat Fruit Bars. As soon as they were out of the oven, she devoured three big fingers of it straight away! They have been a big hit and I have made them a ton of times since – in fact, I like to pretty much always have them to hand, they have become a staple. They are so quick to throw together and are great for afternoon snacks or even a hand-held breakfast. I also love that it is a way to get oats into her, with all their folate containing goodness. Bubba has always preferred finger food, but she has been pretty much refusing spoon feeding altogether lately. So I decided to come up with a way to get the iron-enriched baby cereal into her and this recipe seemed the perfect vehicle. So this is my adaptation of the recipe, with a few other tweaks based on what I have in the cupboard and my general laziness (I hate grating things, hence no grated apple as per the original recipe!). The original recipe is also wonderful as is! 2. Put all ingredients in a bowl and mash/mix with a fork until combined. Seriously, just chuck it all in at once. I don’t even beat the egg first. 3. Pour into (baking paper lined) slice tin and cook until firm to touch – in my oven, this is about 30 minutes. 4. Cool and cut into fingers. Not only is this recipe quick and easy, it’s very forgiving and fun to play around with. If you’d prefer them without the baby cereal, just substitute in an extra 1/2 cup of rolled oats, as per the original recipe. 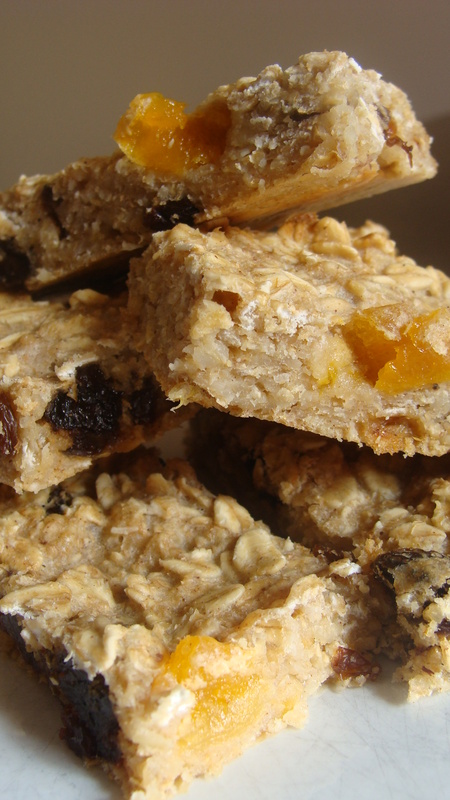 I’m thinking of trying it with blueberries or raspberries in place of the dried fruit – yum! 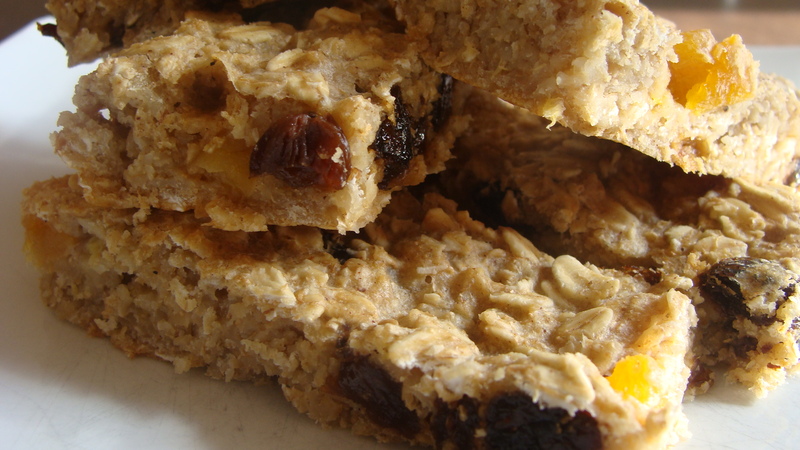 Let me know if you try this recipe – or come up with any of your own variations!